Lady Carnarvon, the Countess of Carnarvon has recently released a new book all about the life at Highclere Castle (the home of Downton Abbey) and how they entertain statesmen, celebrities and royalty – the book is a window into the world behind the scenes at the Castle. One of the main features of the book are the recipes scattered throughout it which are all prepared in the castle kitchens as well as a few which Lady Carnarvon cooks for her family in her home kitchen. As part of her blog, she wanted her readers to be able to follow the recipes and see them being made so that they too can make them – you don’t have to be a Countess to do it! Enter the Multicam setup for filming a cookery show. A cookery show is all about speed because you are always on the clock – as rightly so, food is cooking in front of you. 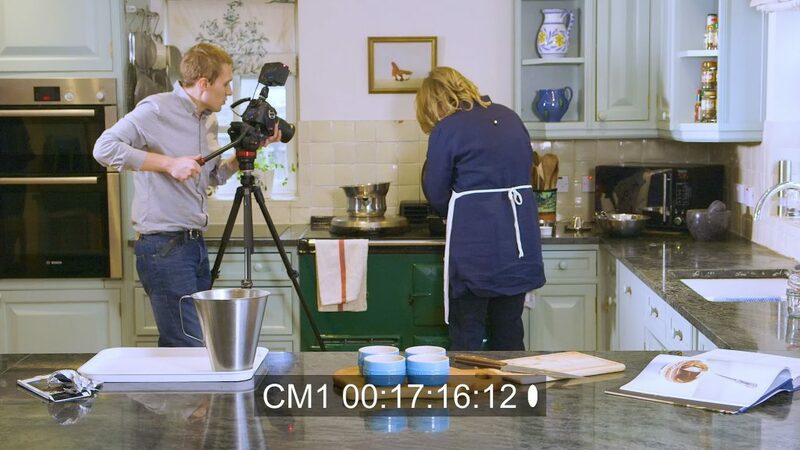 Any cookery show you have seen on the BBC, ITV or any network for that matter, have teams of people preparing the food before it ever goes in front of the camera with the chef. Lady Carnarvon didn’t want that. She wanted it to feel more natural because, in reality, her readers wouldn’t have an army of chefs at their disposal – so why should she? We planned out filming in her open plan kitchen with a two camera setup. One wide angle which would capture the whole process from and a second camera which would cover all of our medium shots, close-ups and all the cutaways of the ingredients. 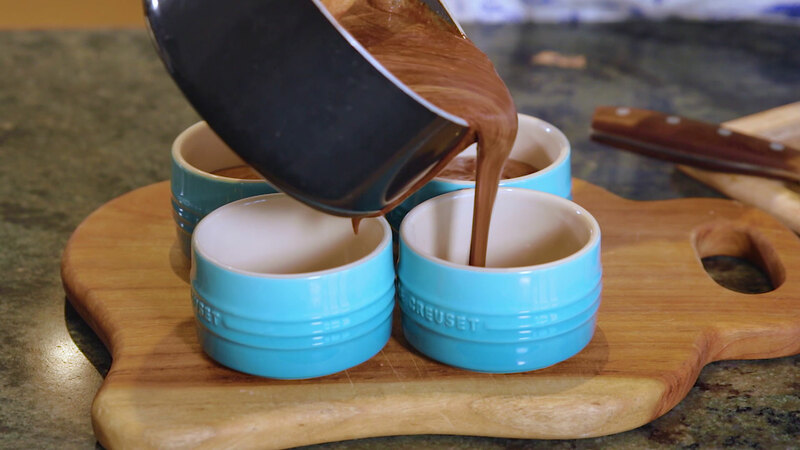 The format of the show would begin with an anecdote about the recipe itself – in the case of the chocolate pot, it was how the recipe was passed down from her mother and is one of her husband’s favourite puddings – then making the dish and finally a taste test at the end with a link to the recipe on her website. 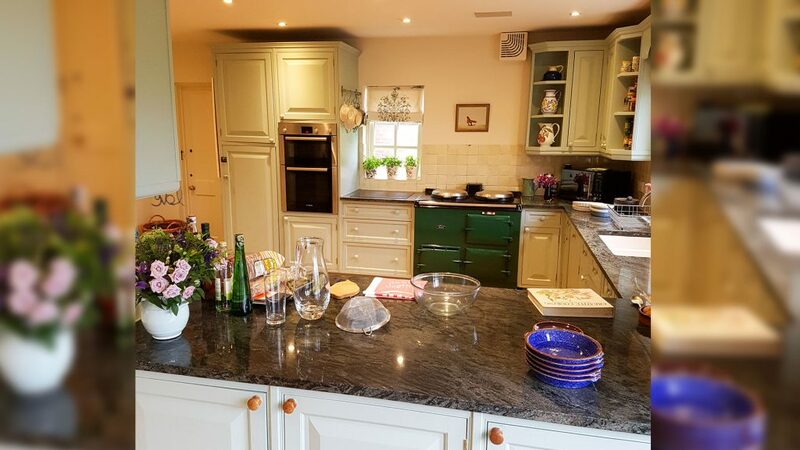 We lit the location, in this case, Lady Carnarvon’s family kitchen with two LED panels – both set to match daylight coming in through the windows. For a hair-light, we kept the kitchen lights on, which were much warmer in terms o colour to give a nice mix and to bring out her blonde hair. I could’ve set up a separate hair-light, but in reality, using the practical lights was far easier and were already achieving the look I want. When you have practical lights (ceiling lights, lamps etc) doing the job, why over-egg the pudding. The most important aspect of this shoot was to remain mobile. My second camera was much lighter and easier to move around than the 1st camera covering the wide angle. This meant that when I needed to over to the Aga and back to the counter – it was very easy to do. What made this possible was lighting the location and not just the shot. Every light served a double purpose and it meant that I could go anywhere in the kitchen and know that all of it was evenly lit. It is also a huge time saver which is vital when you’re on a time-sensitive shoot like this. On every single shoot, I do this and it makes a world of difference not just for me but for the client as well. Another way of staying completely mobile on the shoot was to focus on audio. We hid a lavaliere microphone underneath the apron she was wearing, which meant that she could move around freely (just as I could) and we would be recording fantastic sound all the time. In fact, she could’ve walked up to 90 metres away from the camera and we still would’ve had fantastic sound! Bringing in 2 cameras worth of footage into the edit bay requires a very organised approach. This includes backups. Lots and lots of backups! 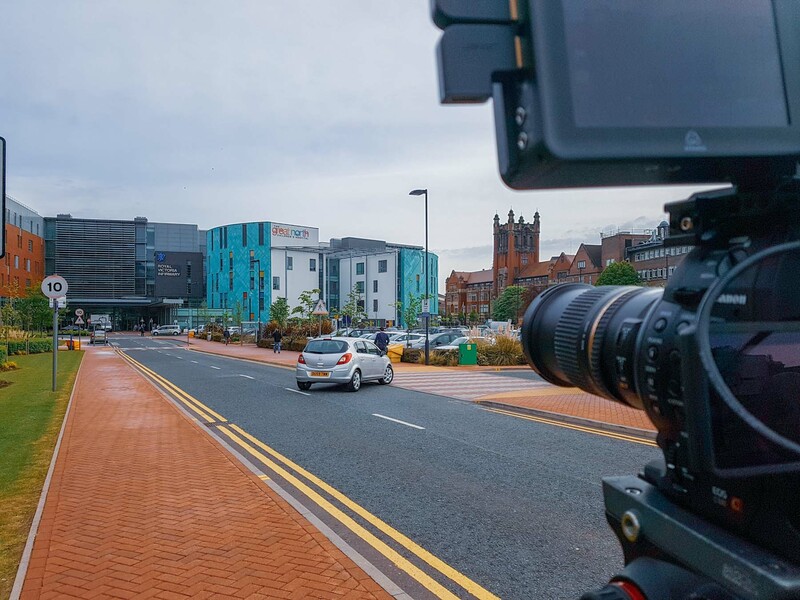 We have a working drive, a backup working drive, an offline back-up and a cloud backup This protects the footage as much as we can because even if we have a total disaster, the most valuable aspect of our work is the footage. Cameras can be replaced. Footage can’t. Once in the edit bay, all the camera pieces are synchronised up, the B roll is organised into folders with descriptions of each shot (so we don’t have to scroll through everything) and all the graphics and titles are brought in at this point. Matching the camera images is very easy in Adobe Premiere Pro because of its advanced colour correction and grading workflow. 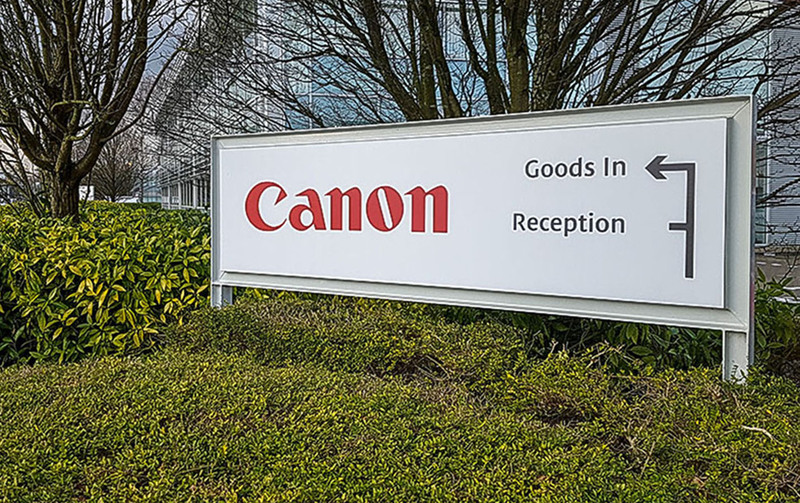 As both of our cameras are made by Canon, they have the same colour science technology – which I think is the best colour science there is for video – which means that the video isn’t jarring to watch in case in one shot someone is wearing a white apron and in the next one, its yellow. 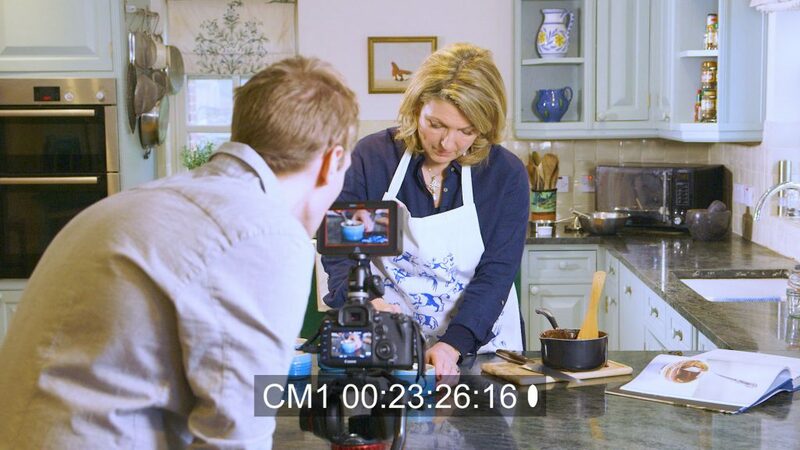 The one thing I will mention at this point, as I haven’t at all, is how much fun shooting this cookery show is! Lady Carnarvon is such a kind-hearted person and I really hope that comes across in the video because that was really important for her to see and for me to capture. The chocolate pots are her mother’s recipe and her husband absolutely adores them (he was so excited to hear over the radio that we made them he dashed over from the castle!). Something like that makes working with Lady Carnarvon a joy. 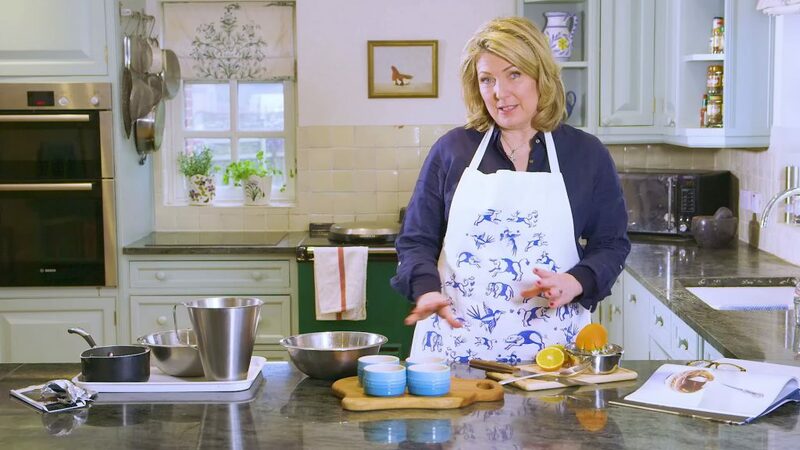 Aside from making me exceptionally hungry, you can read all about some more of the recipes on Lady Carnarvon’s own blog and you can read more about some more videos we’ve produced in our case study. I’m a Swindon based freelance camera operator and editor specialising in corporate video production. Does your video have to be 4K? James Watts is a Swindon based freelance camera operator and corporate video editor. Primary areas: London, Wiltshire, West Berkshire & Hampshire. 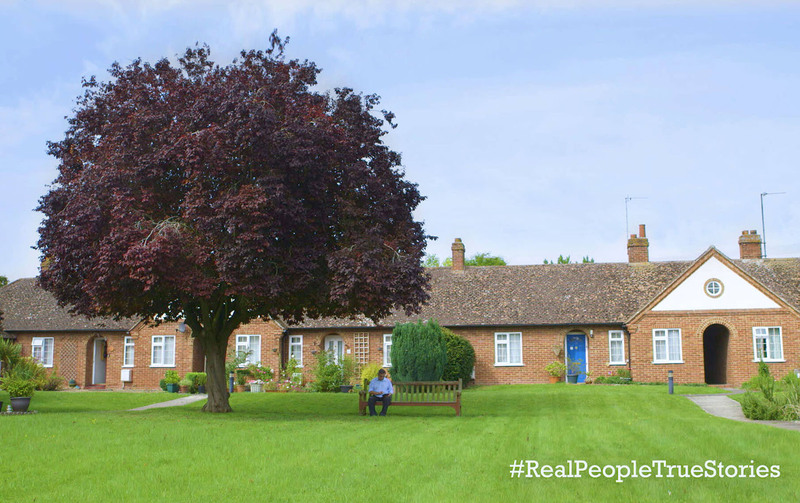 Design Sheep Ltd | Registered in England & Wales | Company number 8919627 | Registered address: The Coach House, Bremhill Grove Farm, East Tytherton, Chippenham, SN15 4LX.